"He who eats and always hungers is fire. He that drinks and is always thirsty is earth. He that runs without tiring is water. He that sings eternal is the wind. Some may debate their gender, however." She smiled slightly here, shifting back to her fae form. Sparkle stood as she sat, shaking out his mane and blowing in her hair. Not a word was said, not a glance traded, but they understood, all the same. With a light touch and a gentle smile, Songhue bid him farewell, listening as his hooves faded in the distance. "Sparkle asks that y'all excuse him, as he has just remembered a few chores he has yet to complete. I believe it is my turn?" She sat silent for a moment, flicking her wings idly as her thoughts churned as a captured wind. Which should she tell? "Who is it that dances to music though he hears not a single note?" Vineda nodded at Songhue's answer. "I agree; the genders are debatable. I stand corrected." She watched the dusk stallion slowly fade through the trees, wondering at his abruptness. Quiet had settled almost eerily now, and it seemed strange to glance around and find their groups so small. She shook her coat out slightly and sneezed a little, then settled again. "I believe he would be a snake." She showed a wolfish grin at the fae and winked quickly. After thinking a moment, her own riddle came forth on a whim. But my work pays off in gold shaded hue." A funny thing happened when Evony finally admitted she was lost, perhaps hours before. She gave up. Sat down, found a mossy patch in the crook opf a tree (ugh), and fell into exausted slumber. When she woke it was sudden, like something big had just happend and woke her up in the process. She heard voices echoing through the surrounding leaves. The girl-child almost smiled - strangly amused to be going crazy after all these years. But instead she sat and listened to the voices, thinking she may as well sit back and be entertaned while she lost her marbles. Evony sat herself up slowly, keeping quiet. Odd. There were people near where she had slept. Well kind of people - they were strange to her. Man, woman, wolf and the weirdest horse she'd ever seem. All of the 'animals' talked. It was a little chaotic at first, but she grasped that there were introductions - that's what woke her up she guessed. Sionayra, she eavesdropped. Never heard of it before. Not that this surprised her, of course. She never had the luck to end up someplace she was familiar with. This definitely was the strangest episode she'd ever had! These.. These 'people' all seemed to change shape! THe wolf didnt change, nor did the man who was now sitting apart from the others or the horse. She missed a bit of the conversation because she was too busy staring at the figures as they changed. She vaguely registeres the riddles. She would have liked them a lot if she wasn't so distracted by the people. Where did the fairy thing come from? There were five altogether now, until the horse got up for no aparent reason and left. Now what? Whenever an episode like this happened, she always wanted to avoid all people. It was too difficult to be around people when you didn't use their common mode of communicatrion. But she'd never run into people like these before. Who knew what they were capable of? How could she approach them if she couldn't even speak to them? She cast about her, looking for something that could help. Hearing the wolf (who was the woman before she changed, she reminded herself in her head) speak a riddle, she mulled it over. The answer was easy enough to guess with some thought. Ants scuttled past her. A spider wove a web between two small branches nearby. A few small bees tickled the wildflowers and clovers not too far away. She waited til a bee was busy with a flower, then swatted him with her shoe. Standing up stiffly and brushing off was harder than she expected. She must have slept a long time. She shooshed the bee's limp body onto a leaf and carried him toward the group. Really hoping it wouldn't recover fast and wake up and sting her before she could put him back by the flowers. She needed it to answer the riddle. The leaf was held before her like an offering as she neared the circle. It trembled as her hand shook and it was hard for her to make sure the bee didn't fall off. SHe got ready to run if they turned on her and watched there every move in silence. Last edited by Evony on Sat Aug 01, 2009 5:58 pm, edited 3 times in total. She tilted her head slightly as a new stranger approached, eyes glowing faintly at the cautious air that hung about the silent female. She was as Songhue herself was, with the appearance of a woman child. The eyes, however, showed all the aged wariness of a very old soul. Had she seen and known enough to learn this care around others early, or was she really older than appearance would indicate? "Welcome," she murmured, nodding respectfully. "I am Songhue, wanderer, and mean you no ill will. These are my friends, Shadow Flame, Monteux and the beloved Vineda. What have you in your palm?" Flicking her wings slightly, the fae quieted as bits of stardust sparked around the deep blue tips, waiting patiently for what would come next. 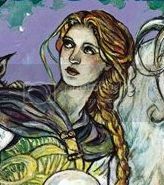 Vineda started as she noticed the fae's attention shift and simultaneously heard the approach of another, but as her gaze fell on the timid one approaching she softened immediately. It was like watching a doe stepping out of the shadowy shelter of the trees. The wariness on the face of one so apparently young was sad to behold. Wanting to smile but not wanting to scare the poor thing even more with her wolfishness, Vineda lay her head back down with a sigh and watched as Songhue reached out as she'd seen her do many times before. The gentleness and patience there was beautiful. She knew better than to shift right now, so there wasn't much to be done. Curiosity abounded at what the girl was holding, but Vineda quickly checked herself, unsure. Making her voice as gentle as possible, "Aye, lass, there there. We mean you no harm. We've been playing games all day. Is there anything we can do to help?" She peered at the thing - a leaf? - in the girl's hand and wondered what it was for as she waited for her to get closer. She very much wanted to put her own human skin back on now, but it would have to wait. The whole lot of them seemed frozen now too. Waiting for her. But they spoke nicely and said they wouldn't hurt her so she advanced further and closed the distance between herself and these people. Her hand dipped lower. he halted a brief moment and treid to stop the trembling then walked into there midst. The fairy talked first so that's where she went because she wasn't sur ewho told the riddle. The bee was held forth like a prize and the girl-child turned to look at the other beings around here. She was pretty much surrounded now and her eyes still darted to watch every mve and every shift of weight. But now she mainly just needed to get them to see that her bee was her answer. Her gaze was searching because her best hope was the one who tolf the riddle. It was one of the femles she was sure from the voice. She pointed with her other hand at the bee in the middle of the leaf and then gestured around the circle as she looked at each member. Heart pounded wildly as she waited. Would they understand?